In a medium sized pot, add in the champagne, water, sugar and vanilla bean and heat on medium-high heat until almost boiling, stirring occasionally. Turn the heat down to low, and add in the pears. Simmer for 30 minutes. Remove the pears using a slotted spoon and set aside. Continue to simmer the champagne syrup for another hour, until it reduces to about 2 cups. Make the crepes as the champagne syrup is simmering. Mix everything together in a blender, or add all the ingredients into a medium bowl and blend with a stick blender. Allow to rest 15 minutes. Heat a cast-iron crepe pan on medium to medium-high heat (I switched between setting 5/10 and 6/10 on my stove). Make sure you give enough time for the pan to evenly heat through (about 5-7 minutes). If the pan is not hot enough, the crepes may start to stick to it. Add about 1/2 tablespoon of oil to the crepe pan and give it a quick wipe using a paper towel. Repeat this process to add on more oil as needed while you are cooking the crepes. Once the oil is hot, add 1/3 cup of crepe batter, and quickly spread it around the pan evenly using a crepe rake. You can also try to quickly tilt the pan to swirl it, but I find it easier to use the crepe rake to make even sized crepes. The crepes should be very thin. Let each crepe cook for about 1 minute, then flip over and cook for an additional 30 seconds. Slice the pears into 1/2 inch (1cm) thick slices and remove the core. Place several slices of pears on the middle of a crepe. Slowly fold the two sides of the crepe over the pears, creating a triangle. Repeat with remaining crepes. Before serving, add on two scoops of vanilla ice cream on top of each crepe and drizzle with the reduced champagne syrup. 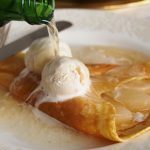 Get this recipe for Champagne Pear Crepes at https://www.theworktop.com/breakfast-brunch-recipes/champagne-pear-crepes/.